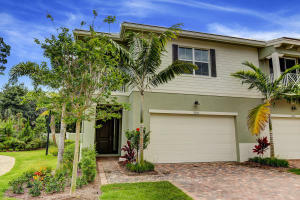 Don't miss this stunning Key West-Style 3 Bedroom 2.5 Bath, 2 car garage townhouse with lake frontage in Hampton Cay located in central Palm Beach Gardens. The spacious and open floorplan is an immaculate and popular Bonaire end unit which gives additional light and wonderful feeling of space. Enjoy over 2100 square feet of living area, 10ft ceilings and hurricane impact glass windows throughout. The owners have installed new tile floors on the main floor and new carpet on stairs and throughout second floor. The residence shows like a model with a completely repainted interior and a welcoming foyer that leads to the large downstairs space which includes an oversized chef's kitchen with stainless steel appliances, granite countertops and dining area.